My 11 am haul out didn’t actually get done until 2 pm yesterday so the rest of the daylight was spent inspecting the hull and pulling out the prop and shaft. Richard (neighbor from Pete’s) was on hand to document the lifting of the boat, calmed the frantic dog and stayed to help for the day (thank you Richard!). Last night we were visited by an athletic raccoon who was disappointed at the lack of snacks aboard and climbed back down the ladder with barks at his back from the extremely irate First Mate. He was full of himself having caught and killed a chipmunk. Thought he could take on a raccoon. HA. Got a paying canvas job for a bimini on a boat owned by the weekend dockyard supervisor. He was astonished that I sew in the boat. Said he wants curtains too. Sun is up, folks are arriving for the day, dog needs walk. Today I’ll be dressed head to toe in a white tyvek jumpsuit sanding everything from the rub rail down. If you come to check it out bring a camera! Wish I could send photos as I go but my camera is one of those pharmacy disposable kinds. Low tech. Condition of hull: No serious blisters are apparent. There was one bottom seam that held a small worm ( !) now extracted. In some places the fibers of the fiberglass are visible so it looks like I’ll be glassing more than just the hole where the shaft had been. Fortunately in 1967 when my boat was built they made them THICK. The waterline is questionable so I’m winging it. Taped up where I think it ought to be and put in a 4″ wide boot stripe to stay on the safe side. 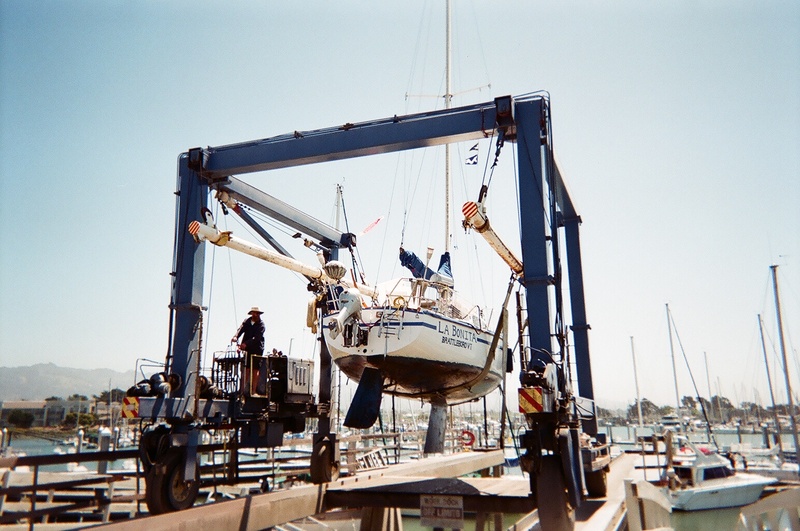 This entry was posted on Tuesday, May 4th, 2010 at 10:48 pm and is filed under Boat Improvements. You can feed this entry. You can leave a response, or trackback from your own site.